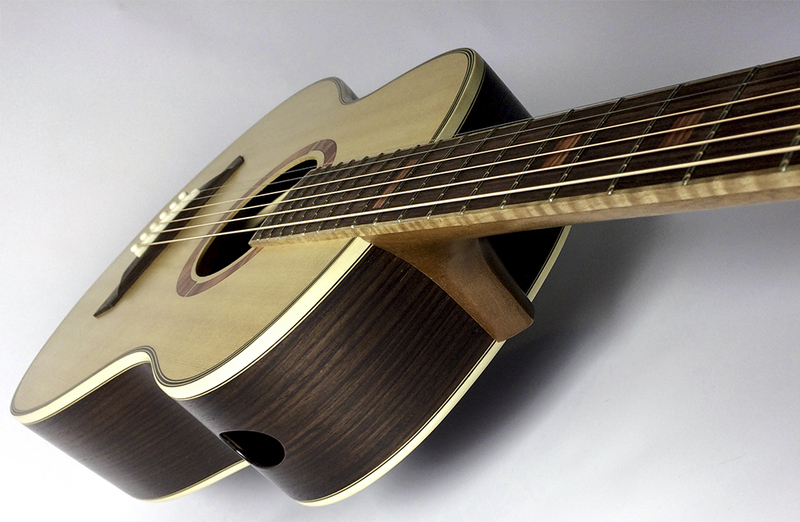 Commissioning a custom acoustic guitar allows you to specify a guitar which is truly designed around your aesthetic, playability and tone needs. The process of commissioning a custom guitar should be an enjoyable and unique experience interacting with your chosen luthier (a maker of stringed instruments such as violins and guitars). As your build progresses you will also most likely receive frequent updates, letting you see the raw timber be transformed into an instrument that will give many years of joy and inspiration. For some though, the thought of having to specify every little detail of a guitar can be daunting if they've never commissioned a guitar before. “What if I don't know exactly what I want?”, “How will I choose nut widths, neck shapes, tone woods and everything in between?​"
Don’t let that stop you! A good luthier will guide you through this, making suggestions and helping you to make choices based on their experience and your needs. Saying that, we also thought that a brief guide might be helpful for those still thinking about it or wanting to try and prepare for when they do speak to their luthier. In addition to this guide, there are plenty of great resources on the internet which cover particular things mentioned in this guide in much greater detail. ​Here we are aiming to provide you with a relatively simple beginners guide to help you make that first step into the custom acoustic guitar world. One of the most important decisions will be choosing the luthier that is going to build your custom guitar for you. For many people, having a great experience and ending up with a great guitar is as much about how you get on with the luthier as it is about the end product. You will be working together to create the guitar of your dreams, so you have to be sure that you will see eye to eye and that you will feel comfortable communicating what you want from the guitar. The same is true even if you want the luthier to completely guide you and build a guitar based on their creativity and experience, taking your personality and style into consideration. You may initially be drawn to a particular luthier for many reasons, be it the type and style of guitars they build, the aesthetics or their established reputation. Whatever your reason, it is often a good idea to first try some of their guitars for yourself. Some luthiers keep a small stock which they are happy for you to visit them and try, others have guitars with boutique guitar shops that you can visit and try them out there. Another good option is to visit one of the growing number of boutique guitar shows all over the world which provide a great opportunity to see lots of luthiers and their guitars all under one roof. As you start to narrow down your luthier choice down, it’s a good idea to get in touch or take a look at their website to find information on their waiting times and pricing, as this may have an impact on your decision too. 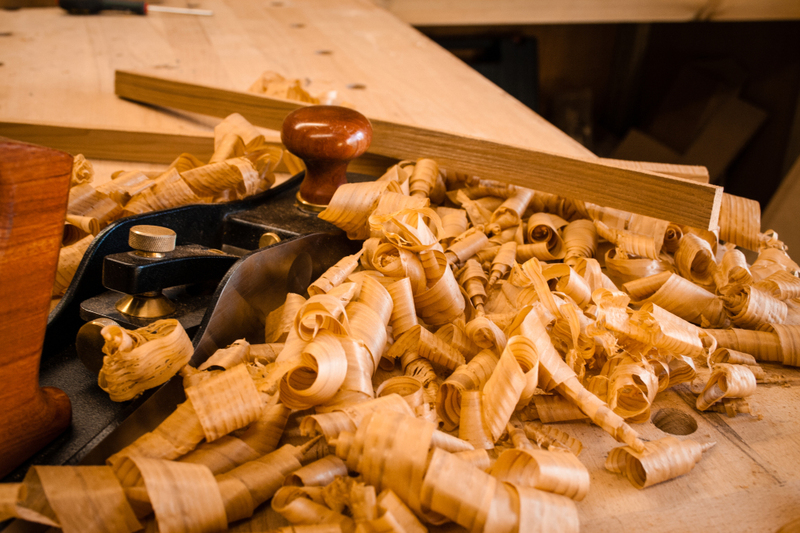 Many luthiers have waiting lists of several months and even years. The next step may be to strike up a conversation with the luthier about what you might be looking to commission. 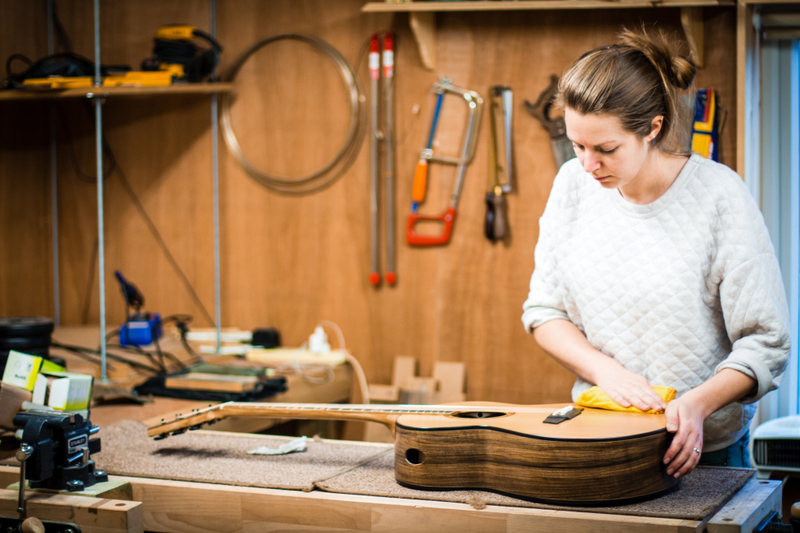 Don’t worry if you’re still not entirely sure at this stage, your luthier should be able to give you loads of advice and guide you through the whole process. This is also a great time to see if you get on with the luthier and check that your thoughts are generally aligned with the expectations you have for your guitar and how involved you want to be with your build. Consider visiting them in their workshop too, if they offer it. Take-away: Choose a luthier that you get on with and who understands what you want. The body size you want may be easy for you to decide based on what you generally find comfortable to hold and play, or you think works well with the style of music you play. If this isn’t you, it’s definitely worth trying a whole range to get to know the general character of different sized guitars. To generalise very broadly, you will find the bigger the guitar gets, the louder and more bass driven it will be. Smaller guitars will be more focused around each note with sweeter trebles. This is very generalised though, as every luthier will approach the build differently, sometimes with quite different results, so always check this with them when choosing. Many luthiers will emulate widely popular shapes from the larger manufacturers such as Gibson or Martin while others offer completely original body shapes which they have created. The steel-string acoustic guitar is a constantly evolving instrument and you may find there is a new body size or shape that a particular luthier has created which really suits you. Something which can be really useful is to jot down a few reasons why you might be drawn to one shape over another. Tone, volume, comfort and aesthetics are probably the four most important factors. What you like, and don’t like; a sort of pros & cons list. If you have your list to hand when discussing this with your luthier it should provide a strong basis for a conversation and helps them to understand your thought process and what you are hoping to get out of your guitar shape. Take-away: Try as many sizes as you can and write up a pros and cons list to discuss with your luthier. Customisable playability features are where handmade guitars really set themselves apart from factory production equivalents. The small-scale builder has the flexibility and the skill to adapt and add in features that you may want in your guitar. For the guitar neck you should try and work out which shape you prefer, why you like it and how it suits your playing style. Some common neck shapes are C, D, U and V in different configurations such as soft, hard and rounded. It’s helpful to have an idea of the shape you like by trying as many examples as possible. If one of your existing guitars has a shape you like a luthier can often emulate and improve upon that for you. Very closely related to neck shape, the next thing you should look at is the neck width at the nut and at the body join. Also measure the string spacing that you find most comfortable to play so that your luthier can replicate that or even improve on it. If you already own a guitar which has features you like, don’t be afraid to take it with you to the luthier who can precisely measure all of this for you. We work to very fine margins so this is often better than measuring it yourself unless you’re handy with something like a caliper ruler. Take-away: Have a rough idea of the shape, width and string spacing you like on your neck. Better yet, take a guitar with a neck you like with you when you visit your luthier. A luthier will most likely offer a range of additional features that can be specifically chosen and integrated into your guitar so have a look on their website or ask them what they offer as they can sometimes make a great guitar just that touch extra special. Some of the other features luthiers often offer are cutaways or scoops which provide more access to the higher frets, arm bevels on the lower bout which make playing more comfortable, fan-fretted/multi-scale guitars for tone and side soundports for the player to enjoy more of the sound themselves. Don’t be limited by just what you’ve seen on offer though, consider what else may aid your playing and you may even inspire a luthier to create a new feature that helps to solve a problem. 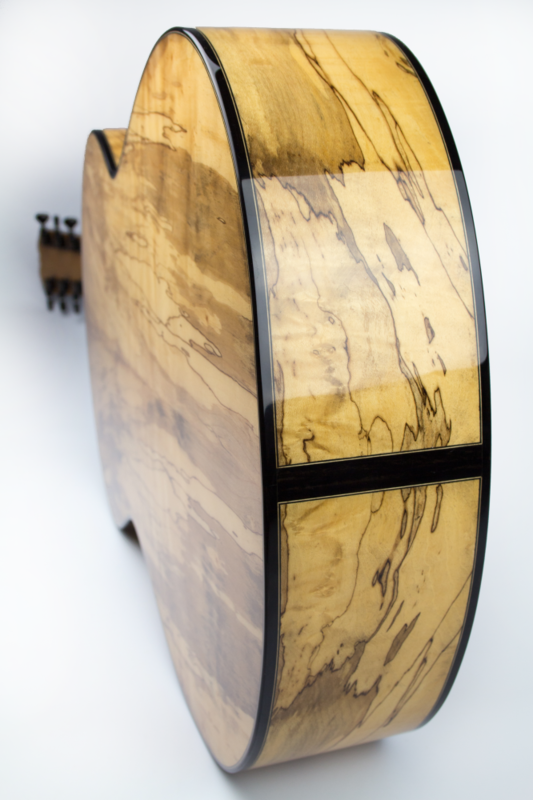 Many luthiers like a challenge so this is your unique opportunity to think outside the box! Take-away: It's good to have some idea of what you want but with so many customisable features available on a handmade guitar discuss what you want from your guitar with your luthier who will be able to guide you. Being able to choose the actual pieces of wood that will be used to build your guitar is one of the most incredible aspects of having a guitar built just for you. You will have the joy of seeing the sawn wood transform into a thing of beauty that will creatively inspire you for many years to come. This is another opportunity to heavily influence the look and tone of your guitar. There are lots of great resources on the internet about all of the popular tonewoods that can be used, their tone characteristics and their visual characteristics. Some of the most common tonewoods are rosewoods, mahogany, spruce and cedar. Some of these are tropical woods though and their availability and control on their trade means non-tropical options are becoming more and more popular. A luthier will often have a large stock of wood that they have been carefully seasoning for months, if not years. They will let you know what wood they have in stock and can even send you pictures of particular sets of backs and sides if you are unable to visit the workshop. 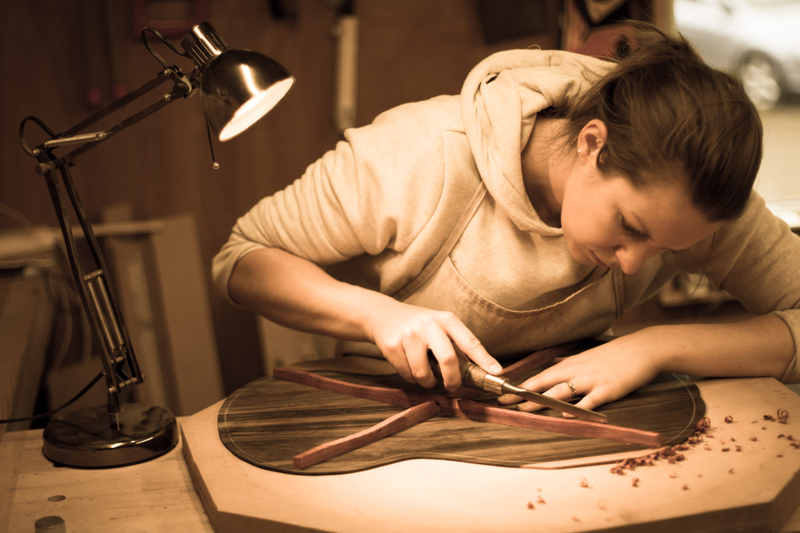 It can be a bit of a chicken and egg situation when it comes to wood and luthier choice. You may choose your woods once you have chosen your luthier or you may choose your luthier on the basis of the timber choices they offer. Depending on their suppliers and how much those suppliers season their wood, luthiers may also be able to obtain wood requested by you which they don’t have in stock. This option varies greatly from luthier to luthier though. 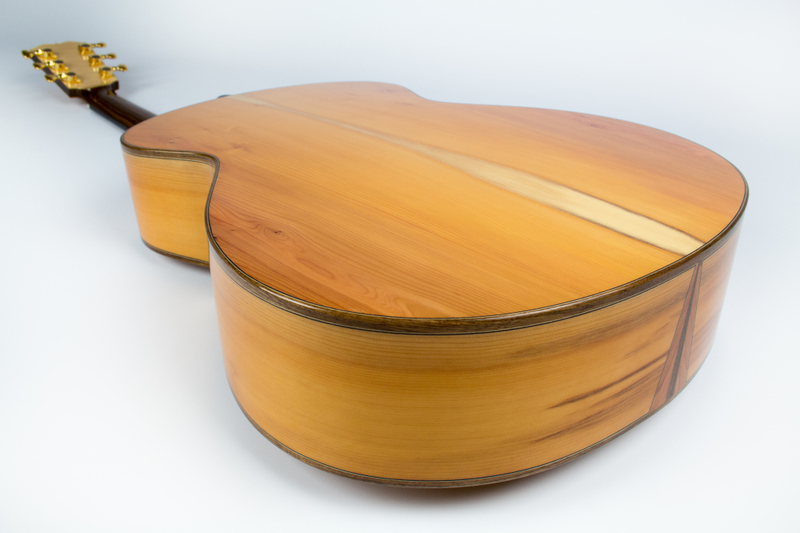 Take-away: If you have a very particular preference for the tonewood you want it’s important to start that conversation as early as possible with your luthier. As you start to do your research into different luthiers, you will begin to see that most have a particular design aesthetic that makes them who they are. They may be influenced by other luthiers or styles, but they will usually have developed an overall look and feel of their own. Look for photos on Facebook, Instagram, Pinterest or similar as well as luthiers websites which usually have a photo gallery. This will help you decide if you like the overall style of the luthier and can see it working with the vision that you have for your custom guitar. Like with pretty much everything mentioned above, each luthier will have different approaches and different levels to which they are happy to take the lead from the customer, so if in doubt about anything, speak to your luthier about how flexible they are on the aesthetics and decide how much that matters to you. Also remember, to make the guitar really personal and unique you can often ask your luthier to add in other complementary design ideas such as inlays, rosette style, fret markers, end grafts and anything else you and your luthier can think of! Take-away: Make sure you like the overall design style of the luthier and discuss any significant departures from this as early as it may not always be agreed by the luthier. Before the guitar is built it’s also a good time to think about whether you want a pick up installed in the guitar, as it’s much easier to install during the build process and you will probably have more options available to you if you come to a decision when confirming the build spec. Take-away: If you're thinking of a pickup have it installed during the build process. It’s the last thing on the list but one of the most important! The finish will bring all of your wood and design choices to life, protect the guitar and influence the tone. There are many types of finish ranging from the lightest and thinnest such as French Polish or Nitrocellulose to more durable finishes such as Polyester and Polyurethane. All finish types have pros and cons as far as durability, thickness of application and tonal qualities are concerned. Another aspect is the level of shine that you want – are you looking for that gloss-wet look or more of a satin sheen. 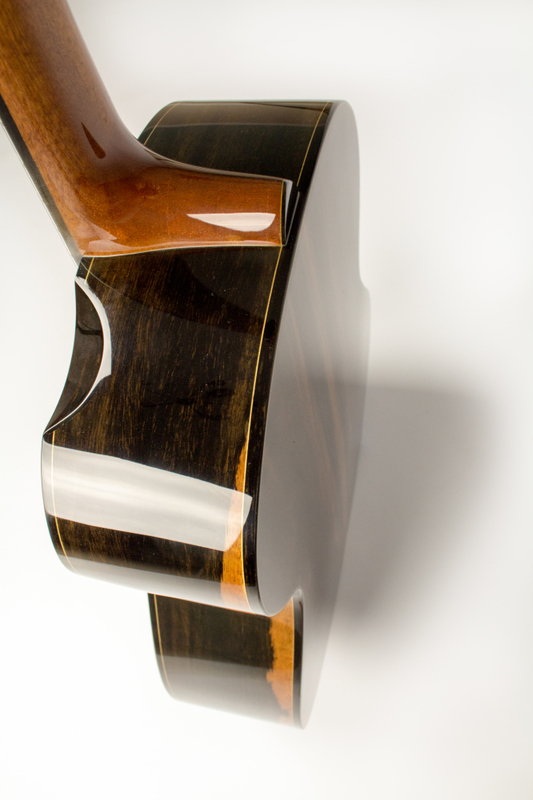 Certain finishes can come with upcharges depending on how the luthier has structured their overall pricing. In most instances finish work is extremely labour intensive and the cost is reflected in the time it takes to obtain a really high quality and durable finish. Finishing is a skill in itself well beyond wood working and some luthiers do it themselves and others contract it out to professional finishers. As long as you get what you want from the finish this shouldn’t make a big difference on your choice of luthier. Take-away: You’ll probably need to balance protection and durability with tone and aesthetics. 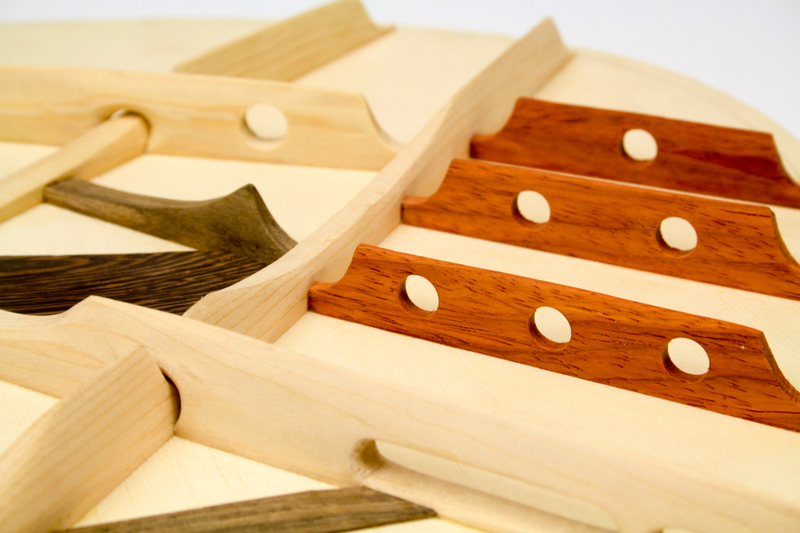 Best to speak to your luthier about this when discussing the finishing options they offer. We hope that you have found this little guide useful and helped you on your journey to commissioning a guitar. 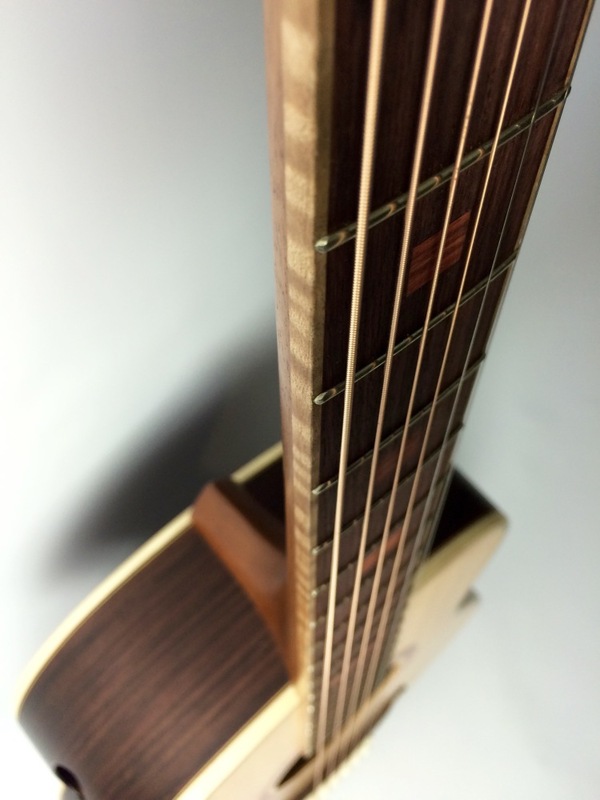 We are a single luthier custom acoustic guitar company and this guidance is based on our own experiences. We have tried to make it as unbiased as possible so that anyone interested in commissioning a custom handmade guitar can use it when choosing to work with any luthier. If you do, whoever it may be with, we hope you enjoy the experience and end up with the guitar of your dreams! If you've found our guide useful or interesting then please feel free to join our mailing list and receive our quarterly newsletter which includes new content and general musings.